More Raspberry Pi fun with Java! For an Adafruit LCD Shield library, check out my previous blog. So, instead of just playing around for fun, I decided to actually do something useful. In this case I wanted a little remote sensor station, which I can plug-in wherever I want to, and communicate with over http over GSM. First of all you need to bunker up on as many DS18B20s and as many AM2302/DHT11/DHT22’s you think you’ll need. There are plenty of articles out there on how to configure them. I decided to do it a tiny bit differently to most examples by hooking up the power pin to the 5V rail (both since the specs indicate that you can run longer cable lengths if you do so and since more current can be sourced from the 5V rail). The data is pulled up to the 3.3V rail, just like in all the examples. Note that a bunch of DS18B20s can be hooked up in parallel and communicated with over a single GPIO port. Also note that this is NOT possible with the DHT sensors, which will need one GPIO port per sensor. In my build I will also use an LCD shield for local control and readouts without necessarily having access to a monitor. I also added a few buttons and LEDs, mostly to satisfy my youngest son. Now, the 1-wire protocol used by the DS18B20 (Dallas 1-wire) and the 1-wire protocol used by the DHT sensors (AM2302, DHT11, DHT22) are quite different. Both of these require a bit of time sensitive bit-banging. Fortunately, that work has already been done for us. For the DS18B20 there are two modules available which will expose all the DS18B20s as files under /sys/bus/w1/devices. Simply add w1-gpio and w1-therm to /etc/modules. Note that you must have the DS18B20s on GPIO port 4 for the module to work. For the DHT sensors there is no module, but I’ve adapted the Adafruit native library described here, to create a native library for Java. Read the README.txt provided in the zip for more information. # Specify devices to use with the dht library in this file. # If you have no such devices, just comment everything out. Note that Pi4J isn’t needed on the classpath. We’re relying on the native library and the w1-gpio mod to provide the necessary interfaces. A simple Java library to read a few different kinds of temperature and hygrometer sensors was introduced. Since release 7u40, Java can run on LEGO Mindstorms EV3. 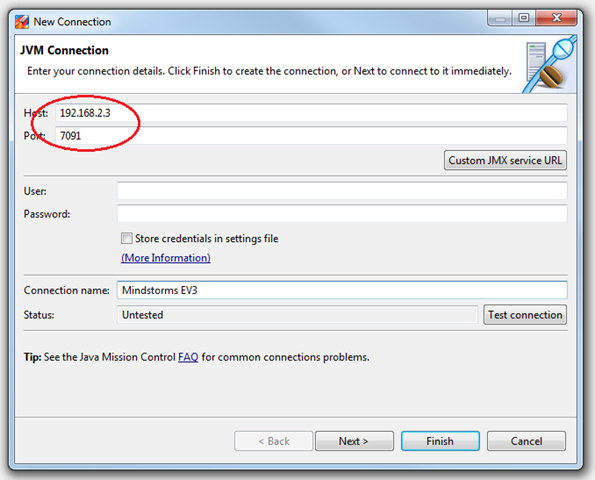 In this post the JMC Team will explore how to use Java Mission Control to monitor Java applications running on Mindstorms. This post is a guest post by the JMC Team. 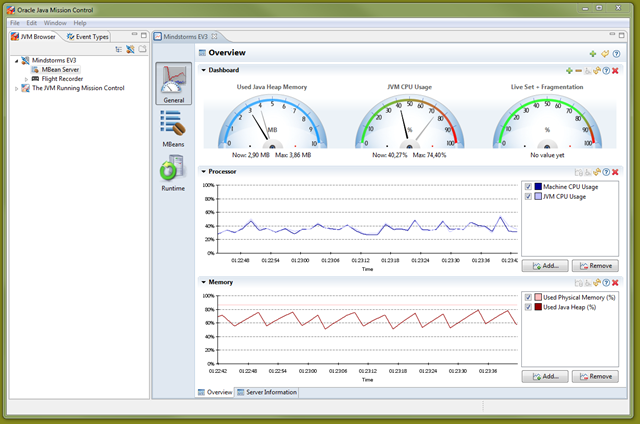 Our primary goal was to show that we can monitor a Java application running on a Java SE embedded platform over JMX. We started off by unpacking our LEGO Mindstorms kit and built the demo robot which was a good way to get to know the components. A simple demo program was present in the default firmware so it was quite easy to get it to run. When we had familiarized ourselves with the different sensors and motors we moved on to actually running Java on the system. The leJOS project provides a Linux distribution that can run on Mindstorms and a set of libraries to control just about anything you can connect to the system. 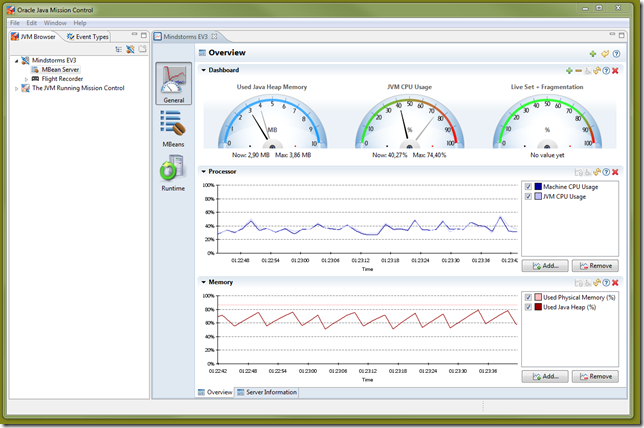 After installing leJOS we verified that we could run Java programs and monitor them using Java Mission Control. 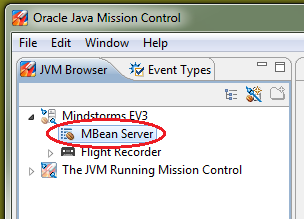 Finally we wrote a program that allowed us to control the robot using the MBean management functionality in Java Mission Control. We used a Netgear WNA1100 adapter which is identical to the official LEGO WiFi adapter. 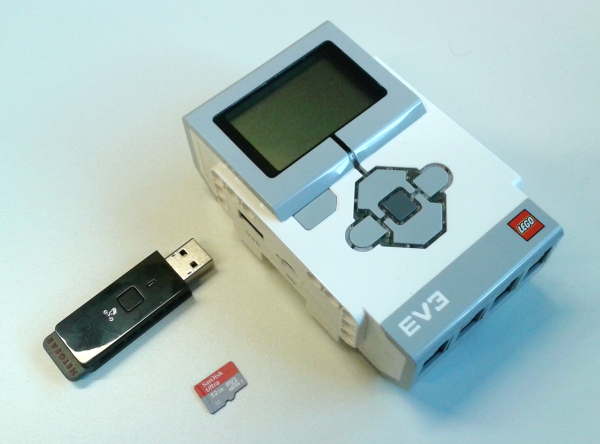 A list of alterative adapters can be found at http://www.rjmcnamara.com/lego-mindstorms-ev3/mindstorms-ev3-compatible-wi-fi-dongles/ but we have not tested any of them. It is worth pointing out that the adapter we used sticks out quite a bit so it has to be considered when choosing what to build. Just about any WiFi router should work. If you don’t have a Linux computer you can follow the guide at http://sourceforge.net/p/lejos/wiki/Running%20Ubuntu%20with%20VirtualBox/ to get a virtual Linux system. A computer for developing and compiling Java programs. To run leJOS you need a bootable SD card with leJOS on it. When you turn on the Mindstorms system with this card inserted it will boot the leJOS distribution. If the SD card slot is empty it will boot the default LEGO system. This is very nice since you don’t have to make any permanent changes to the firmware. You only have to remove the card in order to make it behave as a normal Mindstorms system again. A handy tip is to attach a small piece of tape to the SD card. This makes it much easier to remove the card from the Mindstorms system if you need to update it later or if you want to keep several cards with different contents. To install leJOS on an SD card, follow the guide at http://sourceforge.net/p/lejos/wiki/Creating%20a%20bootable%20SD%20card/. Note that when you insert the SD card into the Linux system for formatting and writing, it is not always clear which device the SD card is using. If the card was mounted automatically you can use the command mount to see which devices are mounted. You can also use the command dmesg to see messages that come when hardware changes are detected. In any event, take care not to select the device for your hard disk. If everything worked correctly you will after a while see the leJOS logo and one or two IP addresses on the screen. One is for USB and Bluetooth networking and the other is for WiFi. Connect to the WiFi IP address using ssh and login as root with no password. This will give you a pretty normal Linux prompt from where you can run your programs. This should result in some beeping and blinking. If you follow the instructions at http://sourceforge.net/p/lejos/wiki/Developing%20with%20leJOS/ then you will get an Eclipse development environment where you can do everything from within Eclipse. If you can’t or don’t want to do everything from within Eclipse then you can set up your own environment. For a minimal setup all you need to do is to get hold of the ev3 library. The first option is to get the latest source files from git. You can do this either by running git clone git://git.code.sf.net/p/lejos/ev3 lejos-ev3 or, if you don’t have git installed, downloading a snapshot of the code from http://sourceforge.net/p/lejos/ev3/ci/master/tree/. 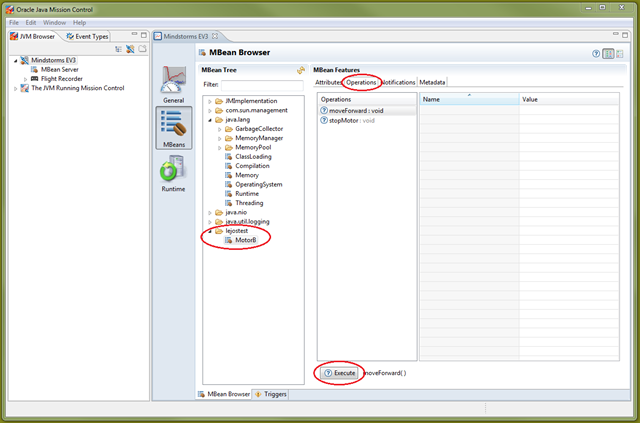 The subdirectories contains various libraries and demo projects complete with Eclipse project files. The ev3classes subdirectory contains the source code for the leJOS API so import at least that into your favorite development environment. You should preferably build the DbusJava and ev3classes projects with ant. 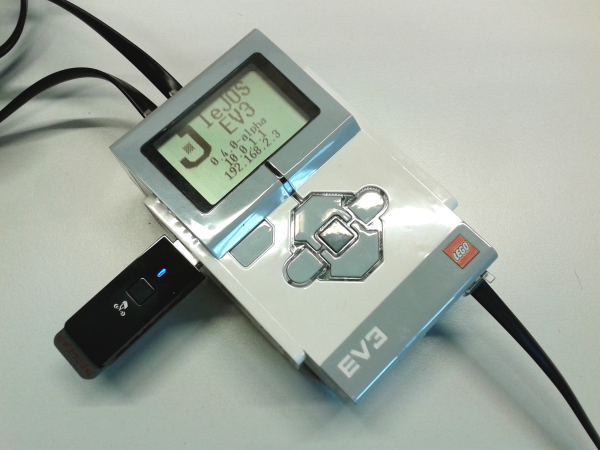 This will give you an ev3classes.jar file which should be placed in /home/root/lejos/lib on your Mindstorms system so that you have the same version of the library when you run your programs. The second option is to take the ev3classes.jar file from the leJOS installation and add it to your classpath. You can find this jar file on your Mindstorms system in /home/root/lejos/lib. Note however that the ev3classes.jar file that is distributed with the leJOS installer is not necessarily the latest so we recommend getting the source code from git and building it yourself if you can. If you followed the guide on the lejos wiki then you can follow their instructions. Otherwise, you can use your favorite scp application to transfer files and your favorite ssh terminal to run your programs. 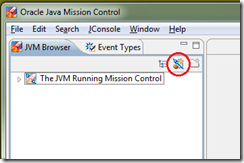 Once the Java process is up and running you can connect to it using Java Mission Control. Add a connection to the Mindstorms IP address and the port number that you chose. Expand your new connection in the JVM browser view and open a JMX Console on the MBean Server. If everything worked as it should you will see a console window displaying the status of the Java process. This procedure is the same for any remote Java process that you want to monitor. 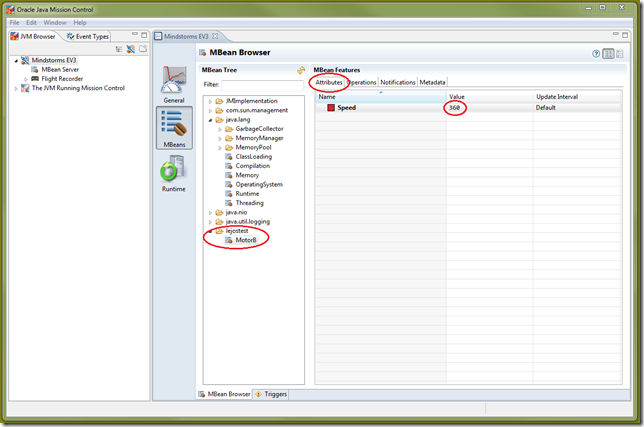 Java Mission Control can auto-detect Java processes that can be monitored through a protocol called JDP. You can read more about JDP at http://hirt.se/blog/?p=388. 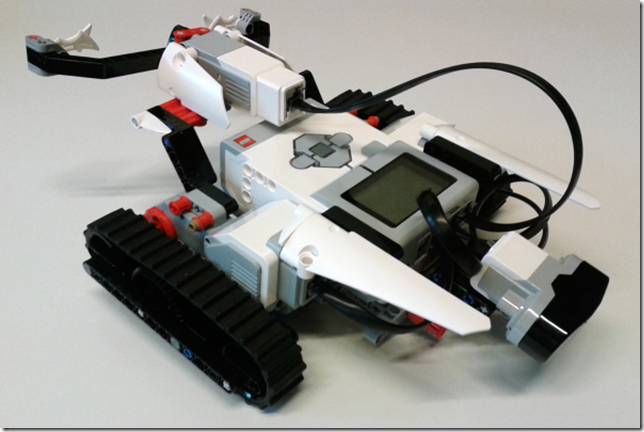 Now you have a Java process running on the Mindstorms system and you can communicate with it using JMX. This allows you to see a lot of information about what the Java process is doing. The next step is to monitor and control the sensors and motors connected to the Mindstorms system. To do this we implement a custom MBean that expose the leJOS libraries. You can read more about MBeans and MXBeans at http://docs.oracle.com/javase/tutorial/jmx/mbeans/index.html. This exposes a small subset of everything that can be done but it will give you an idea of how things work. You don’t have to expose the leJOS library methods directly, often it can be more useful to have more complex operations like ”find a ball” or monitor values like ”number of balls found”. 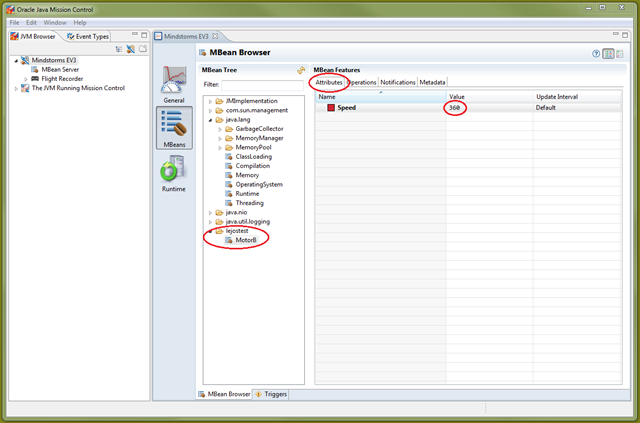 With the MBeans implemented, it is time to create an instance and register it with the platform MBean server. The motor should now change speed. To stop the motor, go back to the operations tab and execute the stopMotor operation. All of these things can be done independently. 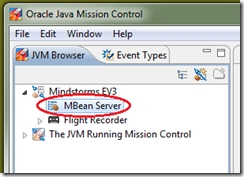 You can run Java programs on Mindstorms without monitoring them, any program running on a supported JVM can be monitored with Java Mission Control, and there are other methods of monitoring MBeans. 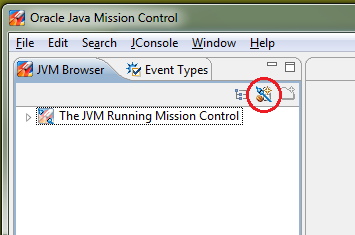 More information about Java Mission Control can be found at http://www.oracle.com/missioncontrol. More information about leJOS can be found at http://www.lejos.org/ and at http://sourceforge.net/projects/lejos/. We’re interrupting the ordinary programming for a series of Raspberry PI related articles. Yep, I finally bought one and started having some fun. It’s a really nice little LCD kit which also features a few buttons. The shield uses a port extender (MCP23017) to get another 16 GPIO ports over I²C. This is quite nice, since you probably want to use your GPIO ports for other things. Also, you can hook up several I²C devices on the same bus, so using the I²C pins for the LCD shield doesn’t mean that you’ve used them up. The LCD shield can be run in various different modes. My little example library uses 16×2 characters by default. I fortunately came to the conclusion I would need a stacking header before soldering everything together, but unfortunately after I had ordered the LCD shield. I am oh so happy I decided to wait for the header to arrive before finally putting the kit together. This I did not do – I ended up trimming down the cable header with my Dremel instead, since it’s too hard to access that area after soldering on the LCD. (Optional) Unused GPIO pins for free! E.g. GPA5 appears to not be in use. Feel free to use it for your own purposes. The library initializes it as yet another input pin by default, but that is easily changed. Once you’ve built the kit, follow the instructions here to try out the LCD kit using the demo python code. 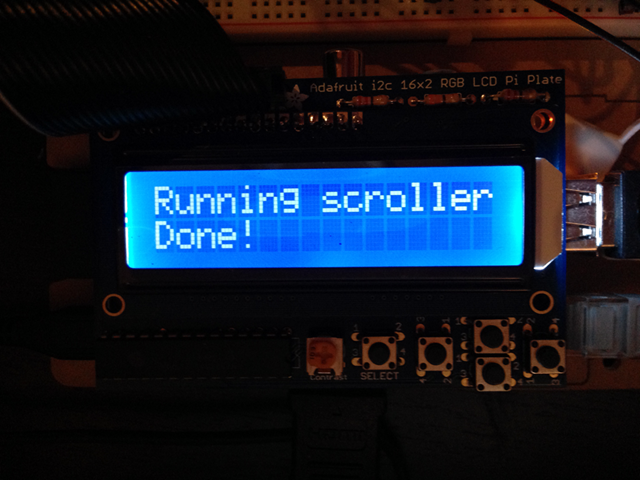 Once you have your LCD shield up and running you can move on to getting everything to run from Java. Once everything is working from python, you are ready to run things from Java. I mostly did a straight port of the Python library. This will be required for most future posts I might put on the blog. The source is available with lcd_src.zip. When running the demos, use the up/down buttons to select a demo, then press select to run a demo. When the demo is done, use up/down to select a new demo. 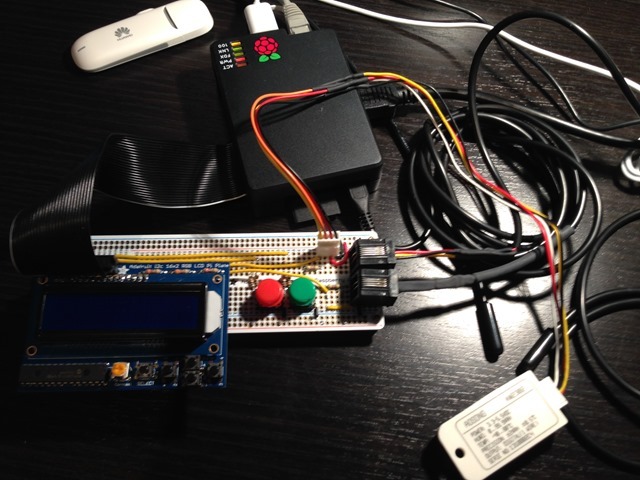 For more examples, check out the demos in the se.hirt.pi.adafruitlcd.demo package. I currently have most of the implementation in my python port LCD class. Anything that isn’t purely reading/setting registers, I’ve handled outside of that class (such as the polling of buttons). If I ever find some time I might clean up the API and move away from the current python port. Note that it might be valuable to read the spec if for no other reason than to understand the limits (e.g. quite small DDRAM buffer). Ever wanted more GPIO ports? Using the MCP23017 is one way to get plenty more. Just remember to provide a unique address by configuring A0-A2 (see page 8 of the spec). Connecting them all to ground will yield 0x20 (which is what the LCD shield uses). Hooking them all up to 5v will yield 0x27. Be careful with how much current you source/sink, both using the MCP23017 (25mA) and the RPi (16mA GPIO, 50mA 3.3v rail, 5V rail pretty much depends on your power supply). If you need to source/sink more than the IO pins can handle, you can use a Darlington Array, for example ULN2803.